I’m so excited to show you the new chairs that I found for my living room makeover! Since I thrift practically everything they’re not “new” new, they’re “new to us” new, lol, which is always new enough for me. I love giving perfectly good things a new home. Having the right kind of thrifted living room seating has probably been the biggest challenge for me to tackle so far for this makeover. Chairs that you sit in all the time should fit your body well, should be super comfy, and of course you should love the way they look too. That is a must! And I’m hoping you can help me with that. Because what good is a comfy chair that you hate to look at? Or a nice chair that you hate to sit in? We shouldn’t settle for either of those scenarios. It’s all about finding the comfort that makes your body happy, the look that makes your heart happy, and the price that makes your wallet happy. Above you can see the pair of thrifted chairs that we had when I shared the living room before photos. We loved them when we found them about a year and a half ago, and we especially loved the $50 price tag. I said these chairs were staying, and I honestly thought they were going to, but after using them for awhile we decided that the seats and the backs were just too low for us. We decided we’d be much happier with chairs that you can lean back into and rest your head if you wanted to take a cat nap by the wood stove fire after doing some reading. And even more importantly we need to be able to get up out of chairs without grunting and groaning. lol. And after I painted the walls white I found that the stripes were too dark and dull for me. I wanted something lighter and brighter. So not only were our bodies not loving these chairs, but my heart wasn’t really into them anymore either. Sorry striped chairs but it was time for you to go. But don’t feel too sorry for them. They’ll be donated to the Restore and I have no doubt that they’ll find a good home. Such is the circle of thrifting. So while I looked, oh so patiently (uh-huh), for just the right chairs at just the right price…the living room makeover was put on hold. Until I finally found them. Woo hoo! 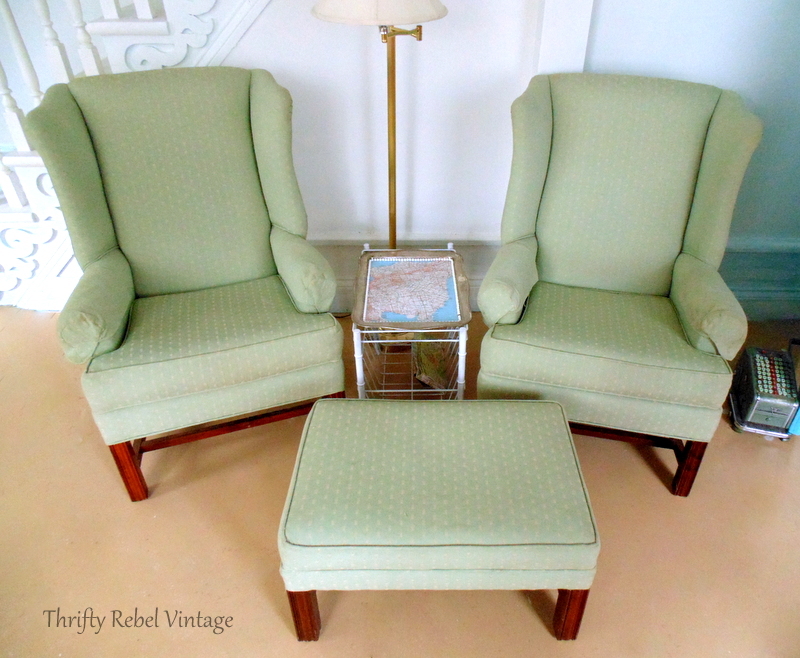 And here they are… two fabulously pretty green wing chairs that also came with a bonus ottoman. Can you guess how much I paid for them? Just $70!!! I think that was probably the fastest I’ve ever said SOLD. Once again the Restore comes to my decorating rescue. When I saw them I just knew they were it. I sat in one of the chairs and guarded the set while John went and found somebody to help us. You can’t walk away from these things or they just might walk away on you. lol. Trust me when I say that. They even came with their matching fabric arm protectors, which are also in excellent condition. I have to say that I have a love/hate relationship with arm protectors. What about you? They’re always falling off and getting covered in cat hair on the floor, but when I have them I feel like I need to use them. I suppose they do help protect the arms. 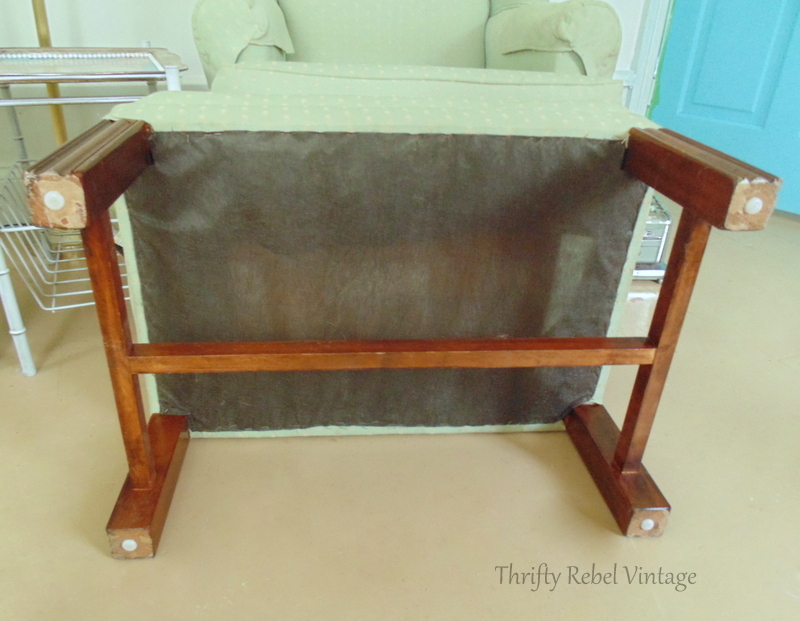 The chairs are a good weight, have wooden frames, and some nice detailing on the legs. They are all in excellent condition… even underneath. 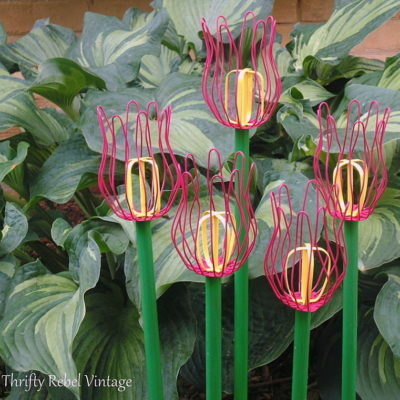 Because I love color I tend to take my decorating cues from nature, and more specifically from my flower gardens. Green is a neutral to me, and pretty much goes with any color you could possibly throw at it. These chairs are higher than the blue ones, very comfy in a fabulously firm sort of way, and the backs are tall and give great support. No more sinking into chairs until we feel like our behinds are almost hitting the floor. lol. Like Cinderella I’m a just right kinda girl, and these chairs are just right. 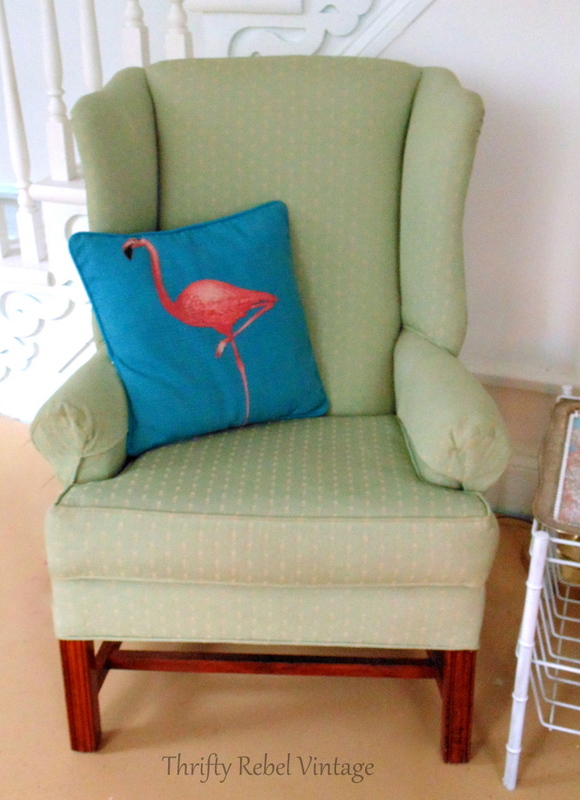 Now you might think because I’m going green with the chairs that my living room inspiration, the pink flamingo pillow, is no more. Just like in my flower gardens I love contrasting colors, and I’m loving this pillow even more than I did with the blue chairs. The neutral green backdrop of the chair really makes this pillow pop. And the pink ties in the color of my hot pink china cabinet. 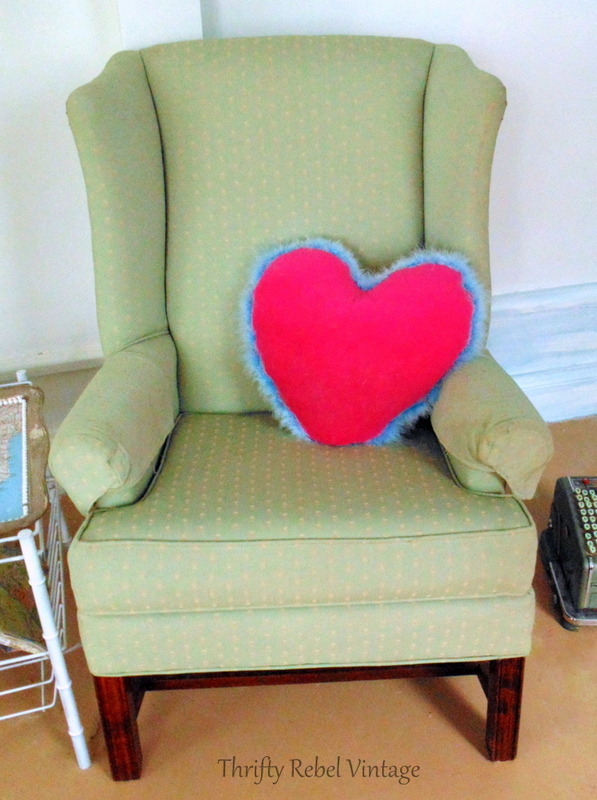 After we brought the chairs home I found this pink velvet heart pillow. It is silly perfection. Both pillows lighten up the formality of these chairs… because this girl doesn’t have a formal bone in her body. And in my world chairs just want to have fun, and I’m just the girl to help them do that. Because these chairs have a classic shape and the color acts like a neutral backdrop different pillows can be added to change the look completely. The blue chairs were stuck in time, definitely the 70s. Not that there’s anything wrong with that, but their look just wasn’t versatile. Wing chairs are timeless, and you can decoratively take them anywhere you want to go. And pillows are an easy and inexpensive way to do that. 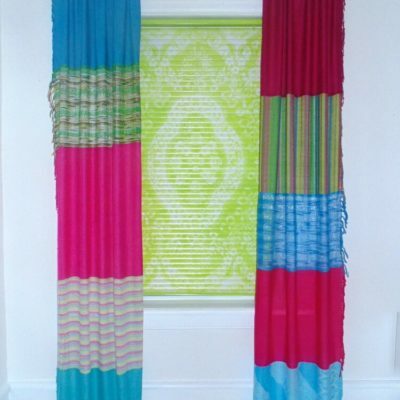 Whatever the look you’re gong for… fun, formal, farmhouse, retro, modern etc etc etc. I love how my chairs look with my repurposed silver tray map table, and my floral tablecloth decouapaged desk on the other side of the room. Things don’t have to be matchy-matchy… they just have to go in a way that you love and that makes you smile. There’s a lot more to do in my living room… like a lamp makeover, floor makeover, stairs makeover, etc etc etc. But now that I found my chairs I hope to be making some real headway. Update: You can check out my diy lamp makeover here. But now on to what I need your help with. Would you keep the legs as they are or paint them? 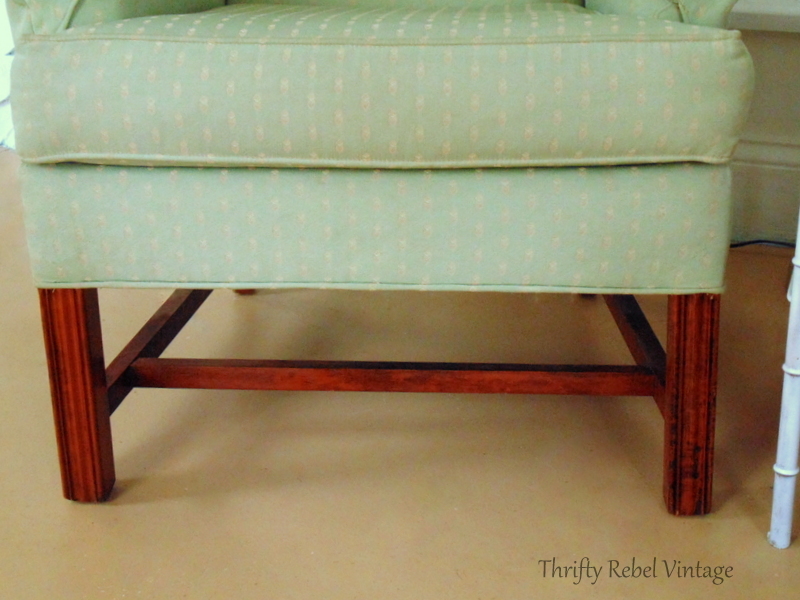 I love the chairs just the way they are, but I wonder if I would love them even more with pretty painted legs. The floor is getting a makeover, which will be in lighter tones but what I’m doing is a secret so I can’t spill the beans. Right now that’s the painted plywood that was beneath the laminate floor that I removed last fall. Maybe I should wait until the floor is done before doing anything to the legs. What a GREAT find! I just love it when I find something I’ve been patiently waiting to find! Serendipity! They are perfect for that spot. Definitely wait til the floors are done to decide what, if anything, to do to the legs. What a bargain! !Great color. Wing chairs are the serious member of the furniture family. Lol. As you say ,they really want to break out and do something whimsical,because wild and crazy would be out of their comfort zone!!!! Really ,in all seriousness,good luck and happy decorating. Thanks so much Charleen! You’re so right, sometimes wing chairs can take themselves a little too seriously. lol. Mine needed to lighten up and just have some fun. Thanks very much! 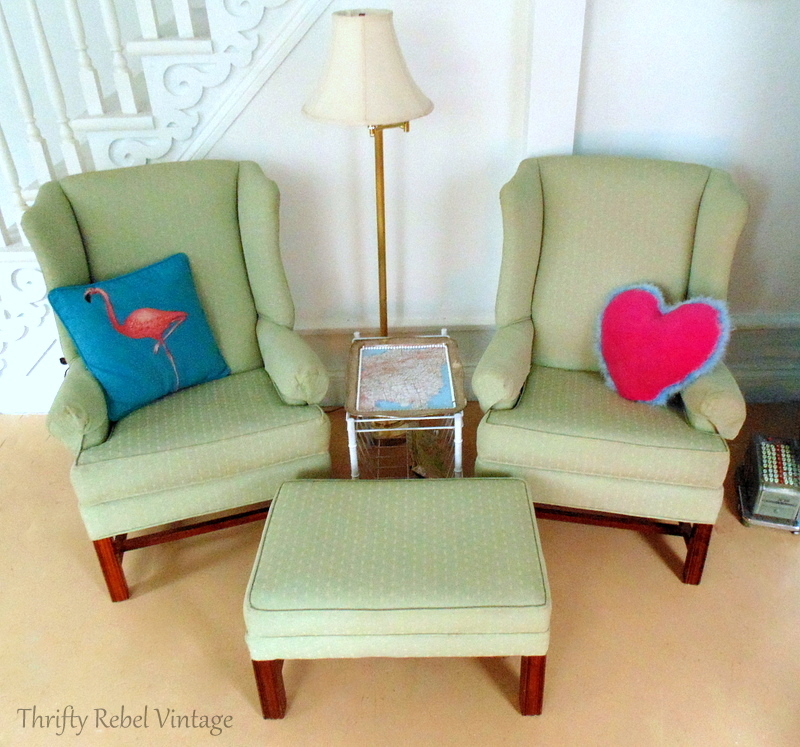 I feel so lucky to have found chairs that are both comfy and pretty, and that will stand the test of time I think. The new wall color is a nice change. Love the detail on your staircase. The chairs are awesome. Lovely color and an ottoman too. Great buy. ReStore is the best. Wait on the chair legs until the floor project is done. Glad you kept the flamingos pillow, we all have some sassyness inside. Great way to start the morning. Thanks for your input Mary! Yes, we all have some sassyness and we should all let it shine. 🙂 I love my flamingo pillow. Personally, I think you should paint the legs white. The reddish wood just does not seem to go with your style. White legs on the green chairs, to me, feels like garden flower vines on a white trellis. To me, that fits you better, and will go with any flooring. Just sayin… ?? Great job finding a great bargain. I also think you should leave the legs the way they are. But I have a question for you…why is there an old adding machine (I’m assuming that’s what it is) sitting on the floor, on the far right f the photo? ?Not sue why it’s on the floor, just curious. Thanks Linda! I use the old adding machine as a doorstop for the door that’s between the kitchen and the living room. The adding machine is super heavy and does the job perfectly, and looks cool at the same time. Fantastic but…. I would not start painting the legs right now. With your present flooring, the woody legs look great as they are. Nice contrast with the floor and great wood that doesn’tt need to hide under coats of paint. If you were getting, let’s say, a wooden floor (?) in the future, the legs of your arm chairs may (or may not) look as good as they do now. You don’t really know, so, better wait before painting them white (possible colour you have in mind…?). I do like “the wings” (sort of Parker-Knoll style) and the height of the seat. Arm chairs and sofas, when too low (and too deep) can be such a nightmare! By the way, when you get older (one day…) I bet you will appreciate perfectly shaped cushion to support the lower part of your back when seating in an armchair… but, for the time being, I guess the relationshp of body and chair is a very happy one so, have a good rest and enjoy your latest green treasures! Thanks for the info Marie! I’ve never heard of twisty upholstery pins for arm protectors. I need to use something that the cats can’t get at, or get hurt by if they get at it. They are very playful creatures, and love to sleep in the chairs. I’ll definitely be checking them out. The new floors will not be wood, but I can’t say any more. 🙂 I think I might have to wait and see how the legs look after the floors is done. Gotta love such a great bargain! I’m a real green lover so these are perfect in my eyes. I would wait until the floor is finished to decide on the legs though. I would paint the legs white. I don’t think you need to wait because white is a neutral that will go with anything regardless of what you do with the floor. The current color of the legs detracts from your other pieces, and I think white would be gorgeous! I love that you are true to yourself in your decorating and I look forward to seeing what you do next!! The chairs are awesome! I am like you – finding a good bargain like that just makes my day. I agree – wait until the floor is done but I do love the wood. 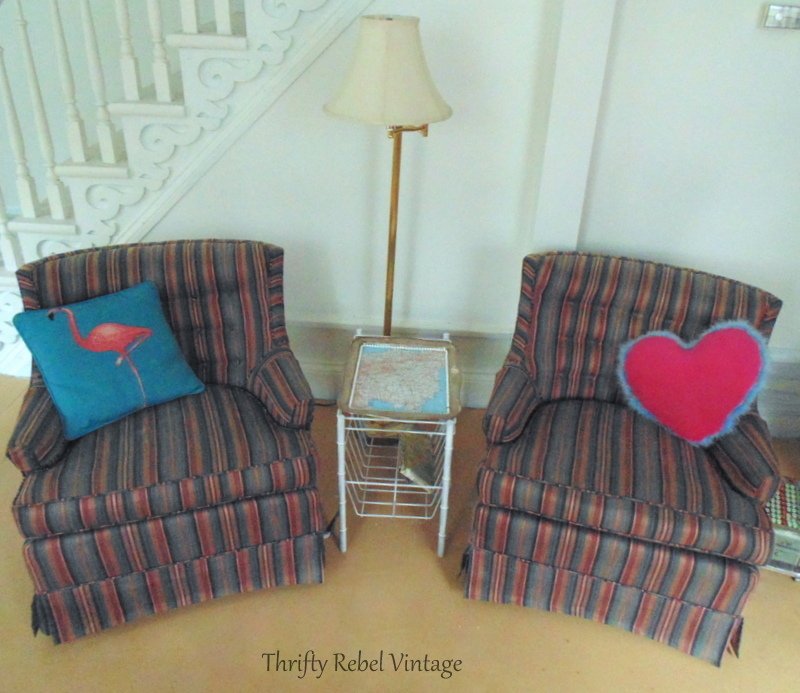 Oh, the thrill of the find & you sure found it in those beautiful wingbacks! Wingbacks are chairs that give you a ‘hug with the side wings’, it’s the most popular chair in the room because of the warmth & comfort it provides & that is what makes it a classic. The arm protectors stay in place with the screw type pins made to do just that. I found mine years ago at Fabricland. The top is a round plastic with a spiral metal piece that when screwed into place, holds those arm covers & can easily be removed for washing. Don’t paint until you audition those chairs with your changes, then make your decision. It is looking really good Tula! Thanks for your comment Cynthia! I do feel very lucky to have found these chairs. They really couldn’t be more perfect for us. I’ll have to look for those screw pins because I know those arm protectors are going to bug me. lol. 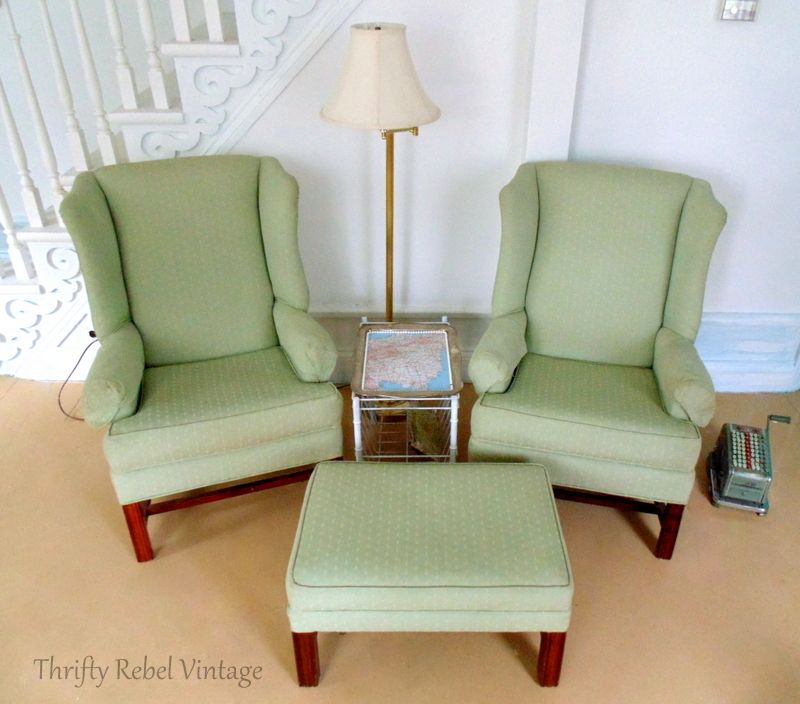 I love wing chairs and yours are such a pretty shade of green. I have had my wings chairs since the late 80’s, recovered once and still going strong. I definitely would wait to do the floor before changing the chair legs. They may look great as is on a lighter floor. 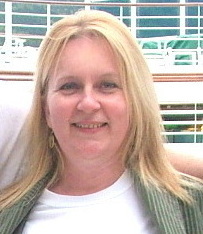 Thanks very much AnnMarie! I hope these chairs will last that long. That’s amazing! There’s something about wing chairs that is just so welcoming. I like the contrast of the wood, so wouldn’t paint them. I personally am doing less wood painting & more of enjoying wood grain for itself, but I sure would go with what everyone else says…wait till you have finished the floors, and I’m sure it’ll speak to you. I’d wait until the floor is done before deciding what to do about the legs. Having said that, to me the legs being so dark means that’s the first thing I see – and they’re not really so exciting are they? I LOVE the chairs. And the price! WOW!! Great find. Thanks very much Laura! I’m a very lucky lady, and I really have to thank my local Restore. I have found so many great things there over the years. Wonderful find. Wing chairs are my favorite type of chair.